Geoffrey Pyatt was sworn in as US Ambassador to Greece in September 2016. He served as US Ambassador to Ukraine from 2013-2016, receiving the State Department's Robert Frasure Memorial Award in recognition of his commitment to peace and alleviation of human suffering resulting from the war in eastern Ukraine. Previously, Ambassador Pyatt was Principal Deputy Assistant Secretary of State in the Bureau of South and Central Asian Affairs from 2010-2013 and DCM at the US Mission to International Organizations in Vienna from 2007-2010. He served at the US Embassy in New Delhi as Political Counselor then DCM 2002-2007. 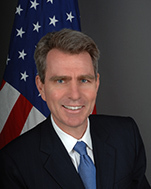 Ambassador Pyatt served as Economic Officer at the US Consulate General in Hong Kong from 1999-2002 and Principal Officer at the US Consulate General in Lahore, Pakistan from 1997-1999. Ambassador Pyatt grew up in La Jolla, California and holds degrees in International Relations from Yale and Political Science from the UC Irvine.